14-3-3 beta/alpha antibody recognizes 14-3-3 protein beta/alpha, also known as 14-3-3 alpha, 14-3-3 protein beta/alpha, brain protein 14-3-3, beta isoform, epididymis secretory protein Li 1, protein 1054, or protein kinase C inhibitor protein 1. Mouse anti Human 14-3-3 beta/alpha antibody recognizes the 14-3-3 protein beta/alpha, also known as 14-3-3 alpha, brain protein 14-3-3, beta isoform, epididymis secretory protein Li 1, protein 1054, protein kinase C inhibitor protein 1, protein kinase C inhibitor protein-1, tyrosine 3-monooxygenase/tryptophan 5-monooxygenase activation protein, alpha polypeptide and tyrosine 3-monooxygenase/tryptophan 5-monooxygenase activation protein, beta polypeptide. Encoded by the YWHAB gene, 14-3-3 protein beta/alpha belonging to the 14-3-3 family of proteins, members of which mediate signal transduction by binding to phosphoserine-containing proteins. This highly conserved protein family is found in both plants and mammals. The encoded protein has been shown to interact with RAF1 and CDC25 phosphatases, suggesting that it may play a role in linking mitogenic signaling and the cell cycle machinery. Two transcript variants, which encode the same protein, have been identified for YWHAB (provided by RefSeq, Jul 2008). 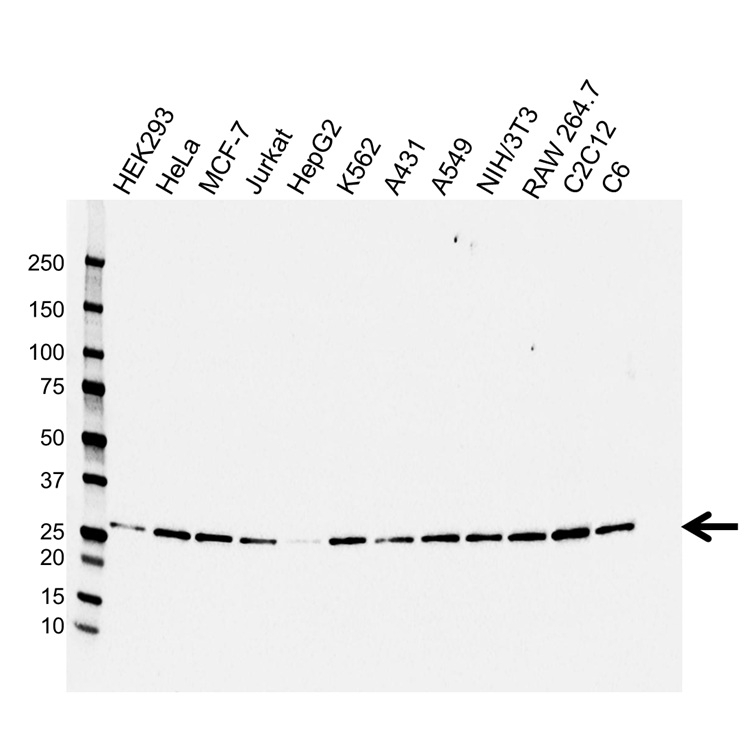 Mouse anti Human 14-3-3 protein beta/alpha antibody detects a band of 28 kDa. The antibody has been extensively validated for western blotting using whole cell lysates.